If you visit Japan it’s highly likely you’ll come across these little (and sometimes not so little) statues in souvenir shops and at shrines and temples. They look a little bit scary, but they make great, traditional souvenirs and gifts. Daruma are modelled after Bodhidharma, the founder of the Zen sect of Buddhism, and are usually red (although other colours do exist). 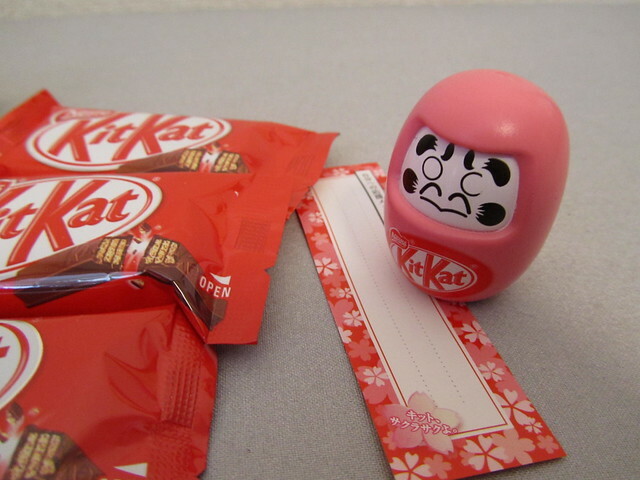 Daruma are toys, but are also considered to be good luck charms. 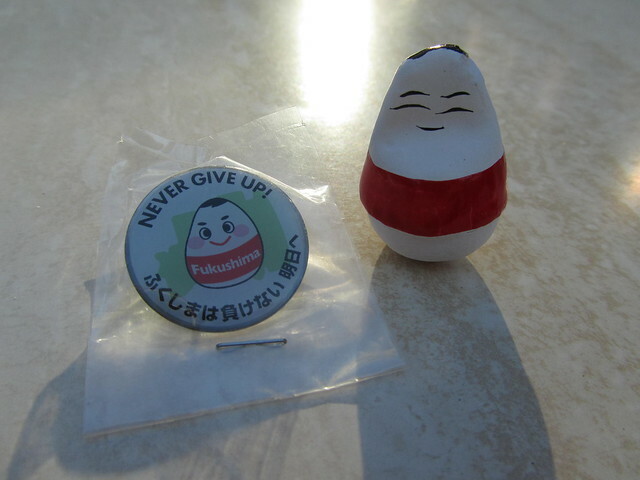 They are seen as a symbol of perseverance and good luck, which makes them a popular gift of encouragement. 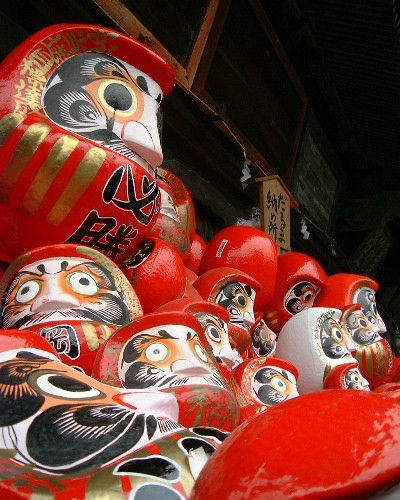 Daruma are also popular at New Year when people are setting goals for the coming year. The dolls are usually made from papier-mâché, and they are hollow, often with a weight at the bottom so that they can’t fall down (like a Weeble or roly-poly toy). However, they shouldn’t be confused with Japan’s original roly-poly toys – okiagari-koboshi (起き上がり小法師), which are also good luck charms symbolising perseverance and resilience. Although okiagari-koboshi and daruma are similar, the original okiagari toy is said to have come from Ming China, around 1368 – 1644. However, the two objects have the same sort of meaning – never give up. A phrase which is often seen alongside daruma is “Nanakorobi yaoki” (七転び八起き), which means “Seven times down, eight times up”. I like this sentiment, and I think it’s one we could all benefit from remembering. 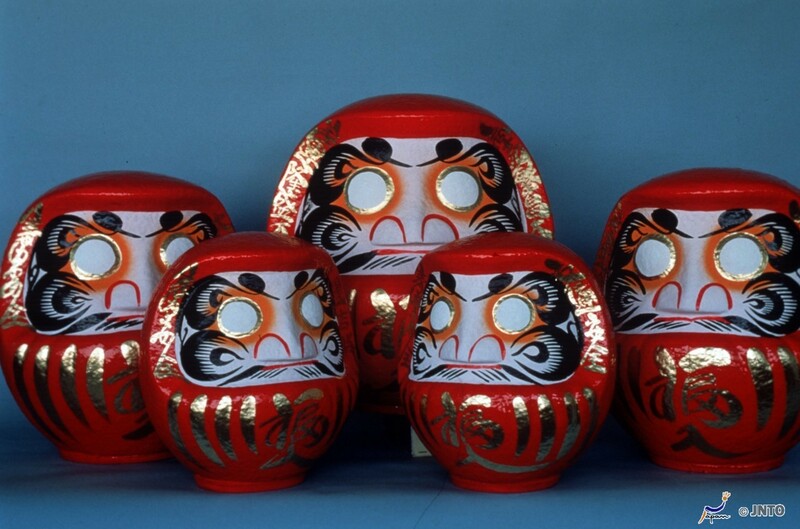 One of the interesting features of the daruma is its eyes. 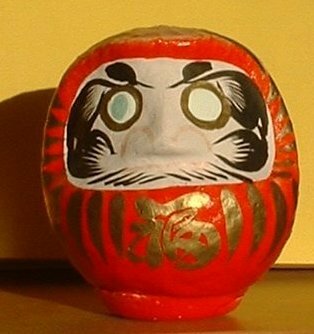 When you buy a daruma the eyes are blank and white. The idea is that when you get the doll and set your goal, you fill in one of the eyes. Then, when you have achieved whatever it is you’re trying to achieve, you fill in the other eye. 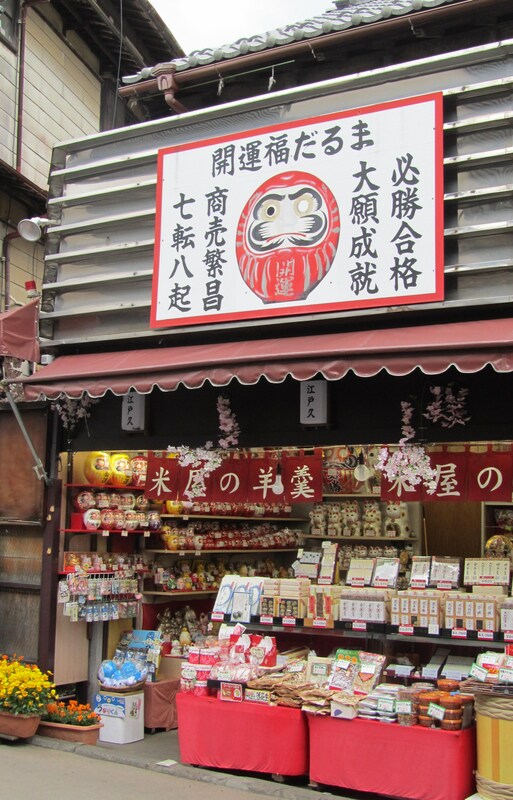 There is an annual daruma festival or ‘market’, called Daruma-ichi (達磨市), held annually by the city of Takasaki in Gunma Prefecture (the birthplace of the daruma doll) on January 6th and 7th. 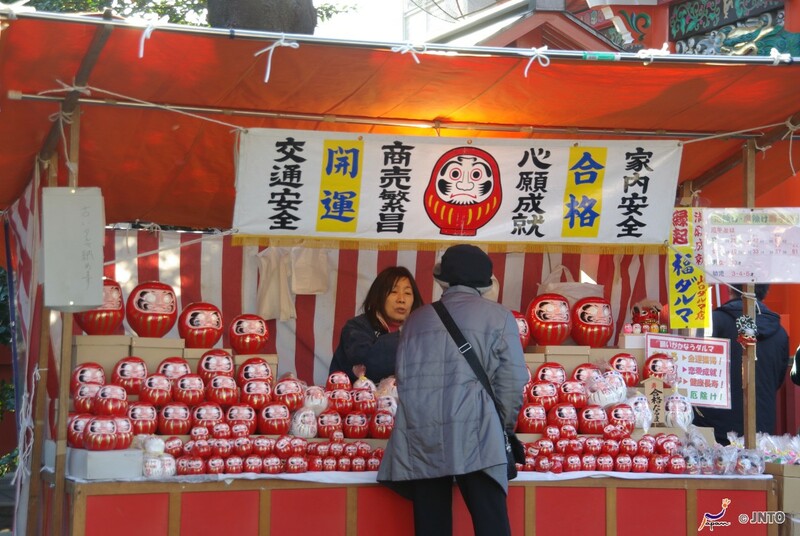 At the festival people can buy new daruma dolls to set their goals for the year. 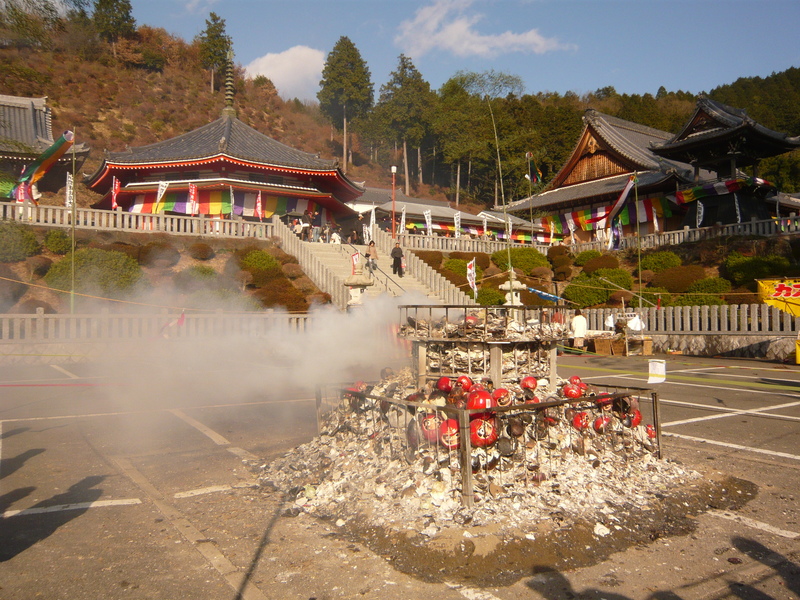 At the end of the year, it is traditional in Japan to burn your good luck charms, and that includes daruma. Personally, I’ve always kept my lucky charms because they make great souvenirs, but most people will take their charms back to the temple where they were purchased and burn them. For daruma, there is a ceremony called Daruma Kuyo (だるま供養) which is usually held once a year right after New Year’s Day. The most famous ones are held at the Nishi-Arai Daishi Temple in Tokyo and the Dairyu-ji Temple in Gifu. Next time I visit Japan I will have to get myself a proper daruma doll though! Hi, I really like your blog, I fell in love with Japan over twenty years ago and haven’t been able to revisit yet, it’s nice to be able to reconnect through your eyes. Thank-You ! Here’s my suggestion for the “ma’ mamushi. かわいい、ね？ Thanks for the suggestions for next week! Daruma make great souvenirs from Japan and are readily available at most souvenir shops in Japan. 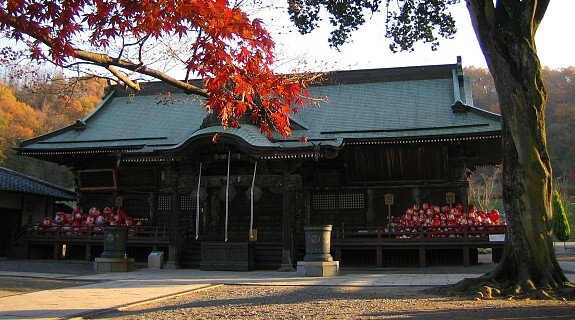 A great place to pick one up at the start of the year is Darumadera Temple in Takasaki, northwest of Tokyo. A few suggestions for next week are Matcha, Manga, Manzai Miyajima and Magome (a beautiful post town). Like lovelycomplex22 I was thinking of matsuri for next week too. Summer always feels like matsuri season to me. Really nice post – you know your stuff. I’d just add that the point about painting the eyes is that the daruma is blind when you get it and painting in the first eye enables it to see. After that it wants to get the other eye too so it helps you achieve your goal so you’ll paint the other one in. « Yo! Vote For Me!